This is an 2016-09-13 update of hopper history and operations. Hope everyone enjoys the research set forth on 14 of the hoppers. 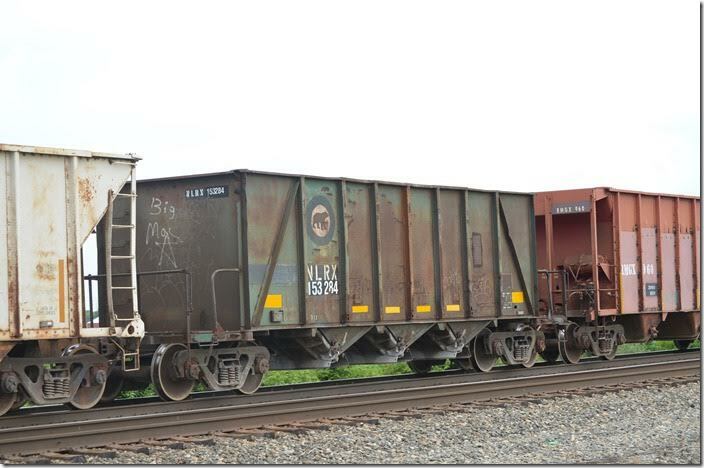 1.RFBX (AK Iron Resources LLC) hopper 1594 was built 11-2014 and has a load limit of 234,100. Pictured at AK Steel’s Ashland KY works on 06-17-2015. 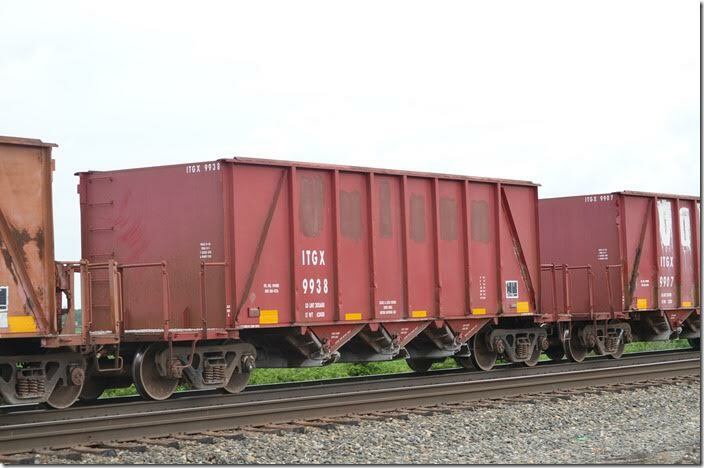 These are new cars, built by Freight Car America. This is a big group of cars (625, series 1000-1624), built beginning by July 2014. 2. 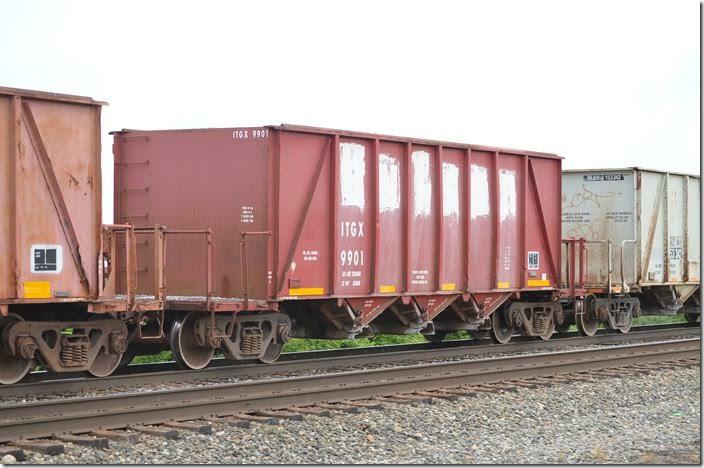 Looks like a switcher is shoving these cars up to the dumper. 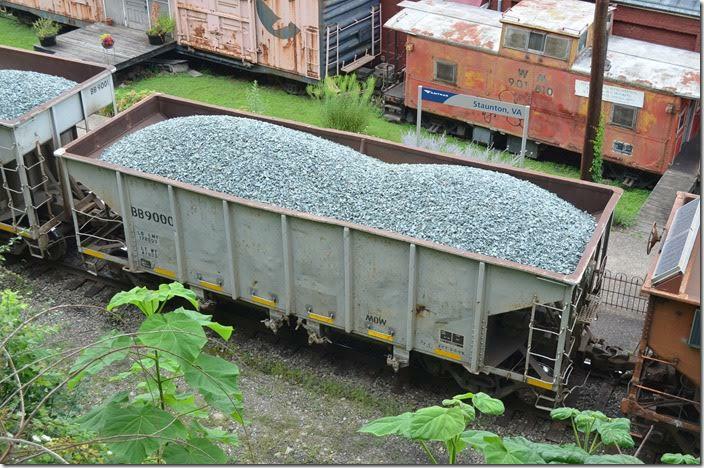 They could be carrying coke, taconite or limestone. Ashland KY 06-17-2015. 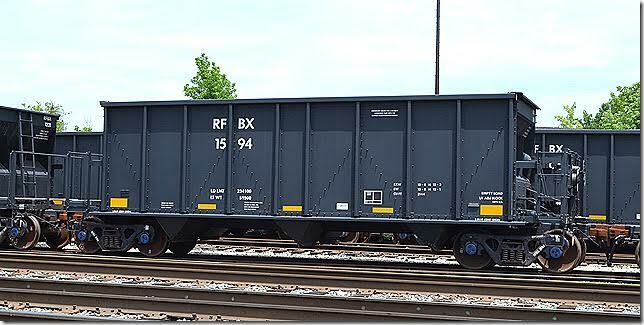 RFBX hopper 1624 Ashland KY.
3. 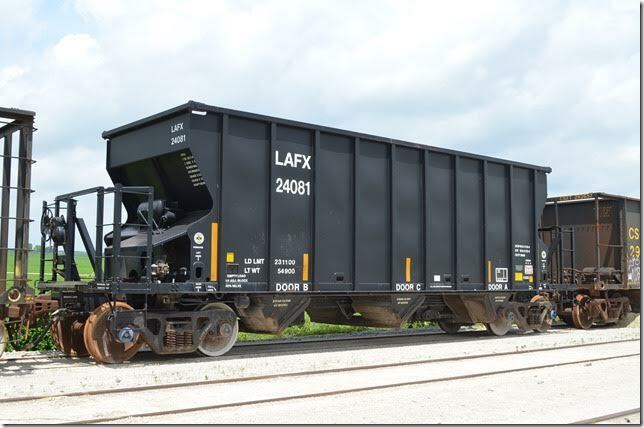 Lafarge Corp (LAFX) hopper 24081 was built by National Steel Car of Hamilton, Ont., in 07-2008. 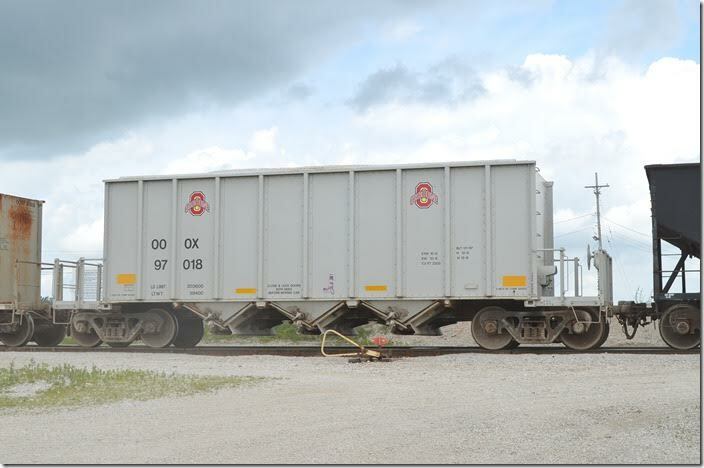 It was parked bad-ordered at National Lime’s plant at Carey OH on 06-18-2015. Series is LAFX 24001-24225. 4. 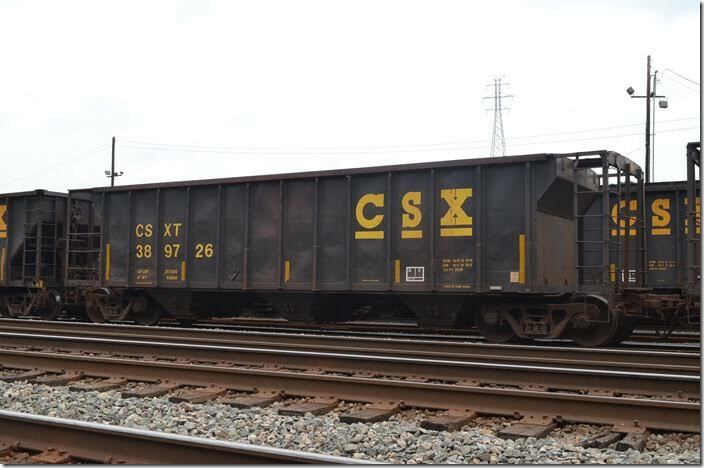 CSX hopper 292534 has a load limit of 226,200 and a volume of 2197 cubic feet. It was built 04-1981. 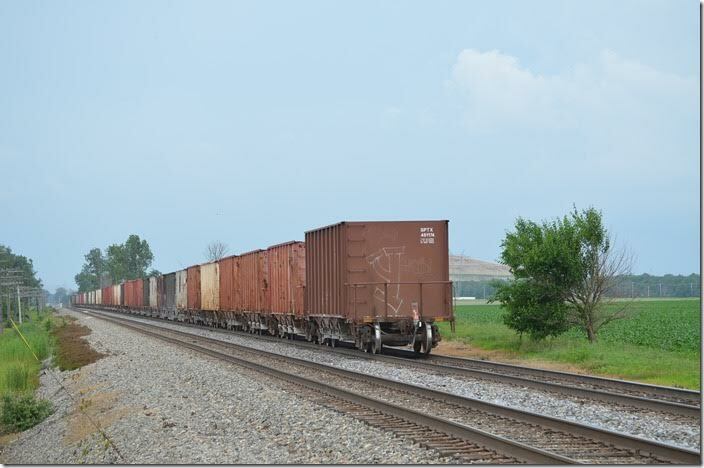 Bad ordered at Carey OH 06-18-2015. 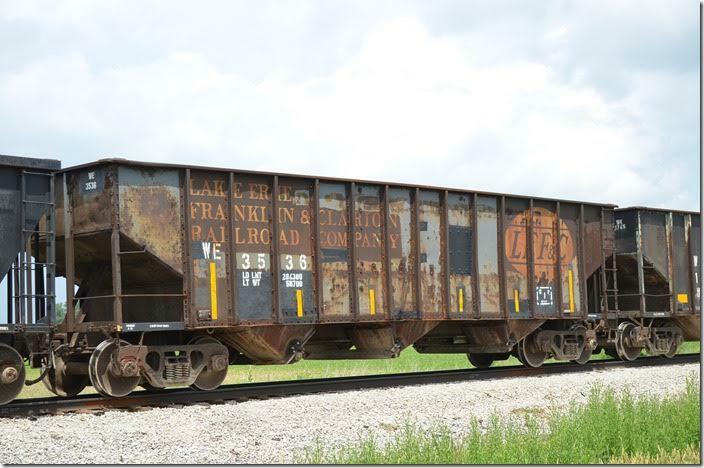 Rebuilt from standard hopper car 350936, capacity 3350 cubic feet. CSX rebuilt over 1000 hoppers this way. CSXT 292534, nee L&N 551000-552299 series, built by BSC. Original capacity was 3364 though most of this design were 3350 cf. Eric. CSXT 292534 is ex CSXT 350936 / L&N 552226. Chris. 5. 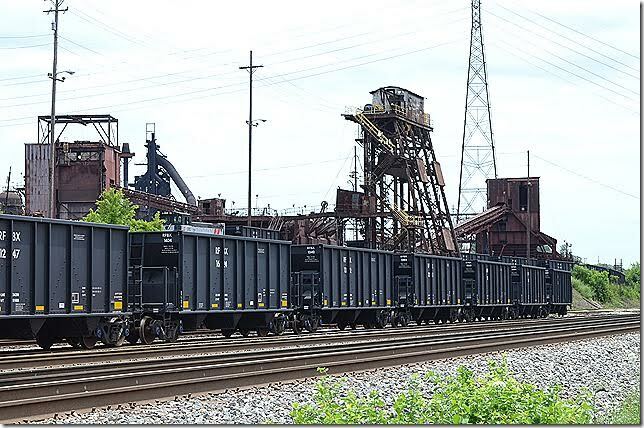 Wheeling & Lake Erie hopper 418 was being loaded at Stone Co. (Shelly Minerals) at Carey OH 06-18-2015. Cars in WE series 400-449 were renumbered from a JAIX 80000 and 90000 series. I know nothing about these cars beyond that; they were rebuilt before 1991. 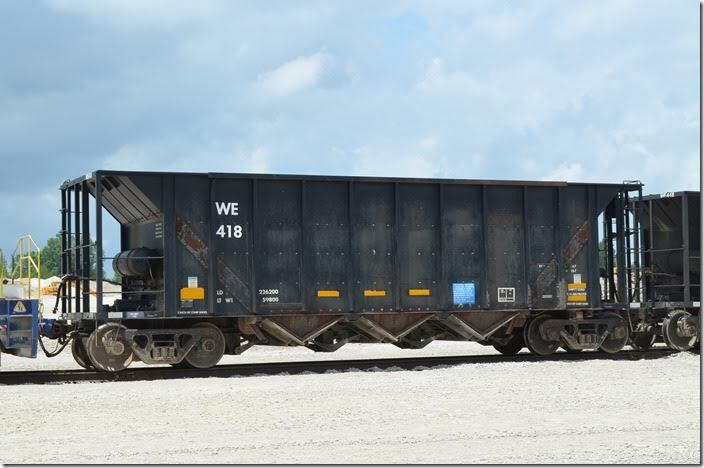 I suspect that they were shortened from older coal-carding cars of 3800 cubic feet capacity (current capacity is 2531 cubic feet). WE 418 is ex-JAIX 80272. WE 418 is ex JAIX 80272 / BUKX 80272 / MIDX 80272. Chris. 6. WE 43117R is a former ICRX (Island Creek Coal) hopper that was built in N&W’s Roanoke Car Shop, I think. It is restricted to home rails. Carey OH 06-18-2015. Its immediate previous identity was CMCX 43117 (Sweetman Construction Company). They may have been CMCX cars since 1991. These are significantly smaller than the ICRX cars, which went to AEX. WE 43117 says EL 32750-32999 built by BSC in 05-1967 to me. 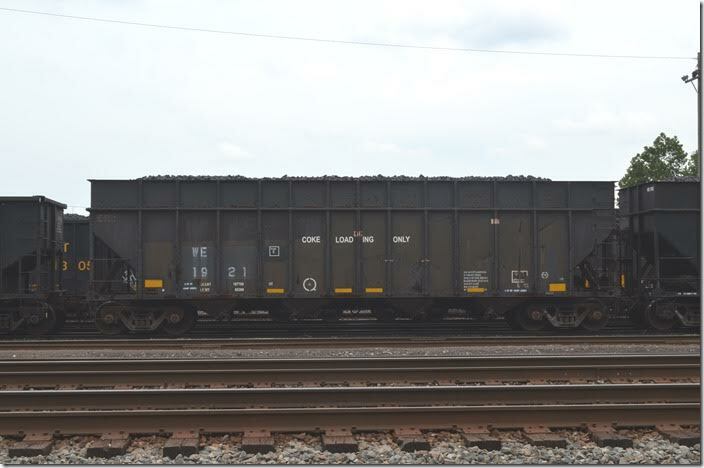 EL was one of the last railroads buying 77-ton coal cars on a regular basis. I'd want to see a built date or more complete history before being sure as there are a few other possibilities. Eric. 7. 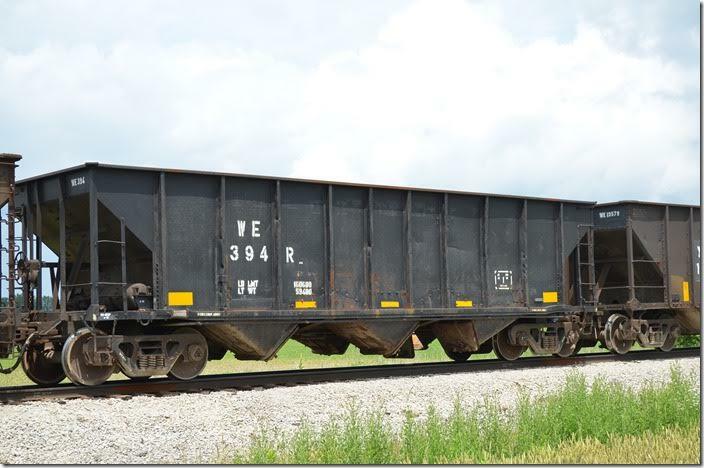 WE hopper 3536 is an ex-LEF&C standard coal hopper now used in stone service. WE 3500-3597 were obtained directly from LEF, same numbers. Carey OH. 8. 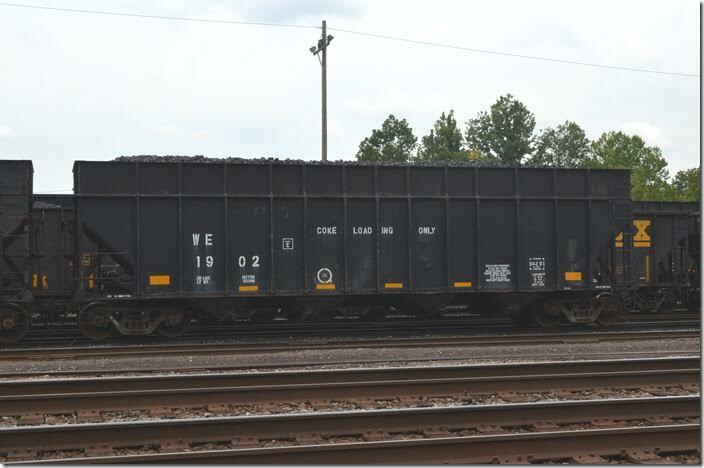 WE 394R is another former coal hopper now in restricted use. Carey OH. WE 309,394 ... Only CB&Q 172000-172499 built CB&Q 04-05-1960. Others built much earlier though I don't see 171850-171899 in the CB&Q production list. Eric. WE 394 is ex WE 548932 / BN 548932 / CBQ 172182. Chris. 9. May have been ex-Burlington Northern. WE 309R and 394 were renumbered from WE 548926 and 548932, respectively. WE series 548850-548999 were ex-BN same, and although I feel like I should be finding something prior to BN, I can’t. WE hopper 309R Carey OH. WE 309 is ex WE 548926 / BN 548926 / CBQ 172170. Chris. 10. WE hopper 315R. Carey OH. WE 315 is ex WE 548996 / BN 548996 / CBQ 172248. Chris. 11. WE 230021 hopper is ex-DJJX or DJLX …or DJTX! The series is 230001-230030. Carey OH. WE 230021 is ex DJTX 230021 / JOGX 8959 / JTSX 900647 / NOKL 910324 / ATW 9224. Chris. 12. WE hopper 230006. Carey OH. WE 230006 is ex DJTX 230006 / JOGX 8944 / JTSX 900632 / NOKL 910199 / ATW 9099. Chris. 13. Osborne Inc has a logo that reflects some Ohio State Univ. influence. OOOX hopper 970002. Carey OH. 14. 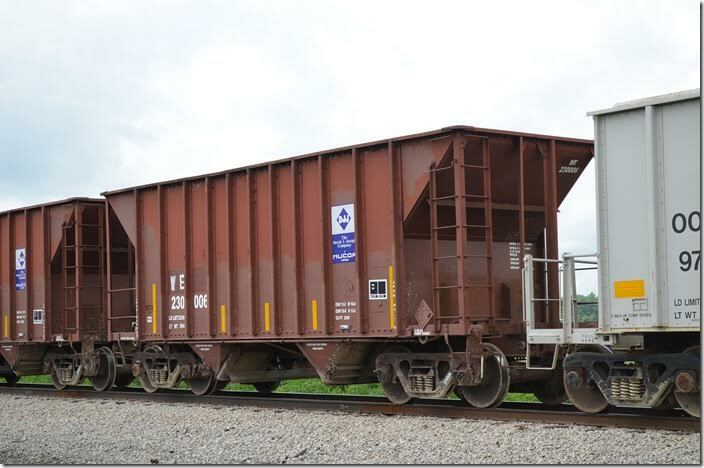 Osborne Inc 97018 hopper has a load limit of 203,600 and a volume of 2,300 cubic. Osborne cars look remarkably good considering they were built in 1997. Their transit route must avoid “bad neighborhoods.” Carey OH 06-18-2015. The OOOX series is 97001-97060. 15. NLRX is the reporting mark for National Lime & Stone. Maybe ex-Algoma Central? On CSX K934-17 heading from Fostoria to Carey. 06-18-2015. Ex-HKGX (Haines & Kibblehouse, Inc.), same numbers. They originated in AC series 8330-8500; some came via the SSAM or WC 208330-208500 series. National Steel Car was the builder, during 1974 and 1975. NLRX hopper 153284. Fostoria. NLRX 153284 ... CSXT 351147-351157 were from same AC series (8201-8500). Eric. NLRX 153284 is ex HKGX 153284 / SSAM 208492 / AC 8492. Chris. 16. ITGX is a reporting mark for The Andersons. Car was formerly used by Vulcan Materials. 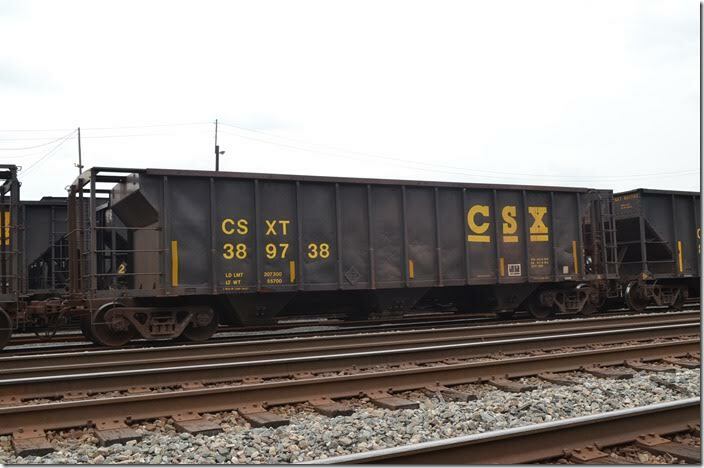 On CSX e/b K934-17 empty rock train. ITGX 9901 and 9938 (series 9900-9941) originated as GRR (Georgetown Railroad) 803 and 894, respectively, built by Ortner in 08-10-1974. ITGX hopper 9901. Fostoria. 17. ITGX hopper 9938. Fostoria. 18. SPTX 481174 hopper is Trinity or First Union Rail. K934-17 heads for Carey OH. Trinity Rail Management. The car is ex-SP, same number. Not sure how much it was rebuilt. Series is 481150-481399. Fostoria. 19. 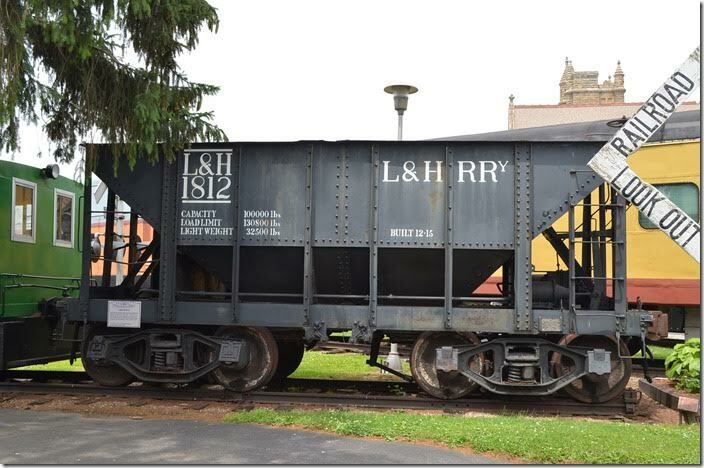 The ore hopper at the Mad River & Nickel Plate Railroad Museum in Bellevue KY was acquired from Standard Slag Co. in Youngstown. Whether it was originally Lehigh & Hudson River Ry., I don’t know. 06-19-2015. L&H wasn’t a valid reporting mark for the L&HR, as far as I can tell. L&HR hopper 1812. Bellevue KY.
L&H 1812 may be exactly as it appears. L&HR 1800-1819 ordered from PSC in 09-1914, built 1915. Used for zinc ore, originally had roof. However, capacity data may not be true to 1915. Eric. 20. Buckingham Branch Railroad 9000 hopper is being backed by the Staunton VA station (former C&O) to dump ballast in their shop area at “C&O Flats.” Some CSX ballast cars were also in the train. 07-30-2015. BB 9000 is shows as ex-BB 1. Definitely unique on BB, but I can’t get any prior information on it. 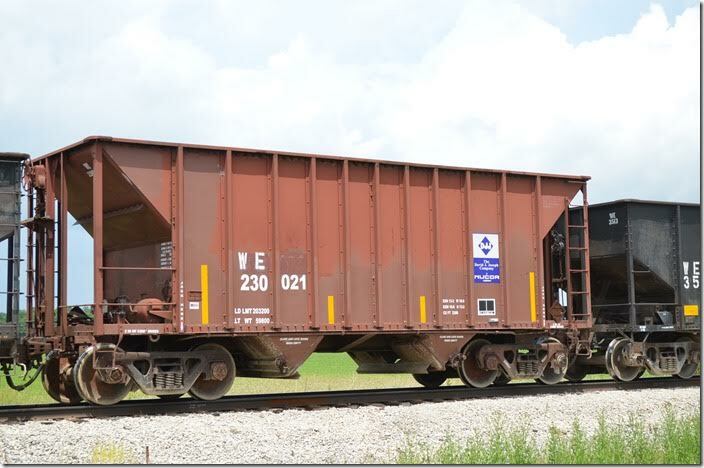 BB ballast hopper 9000. Staunton VA.
21. 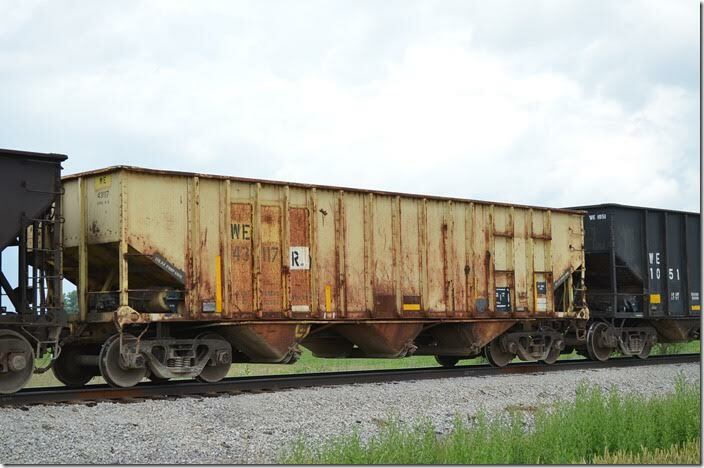 Former covered hopper converted to ore service. AK Steel Ashland Works, 08-17-2014. CSXT 389726 and 389738 are ex-CSXT 224339 and 224427, respectively. 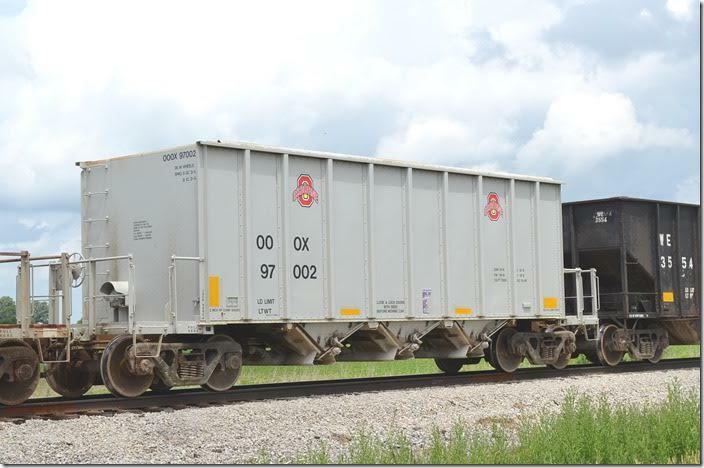 To the best of my knowledge these can’t be ex-C&O covered hoppers. 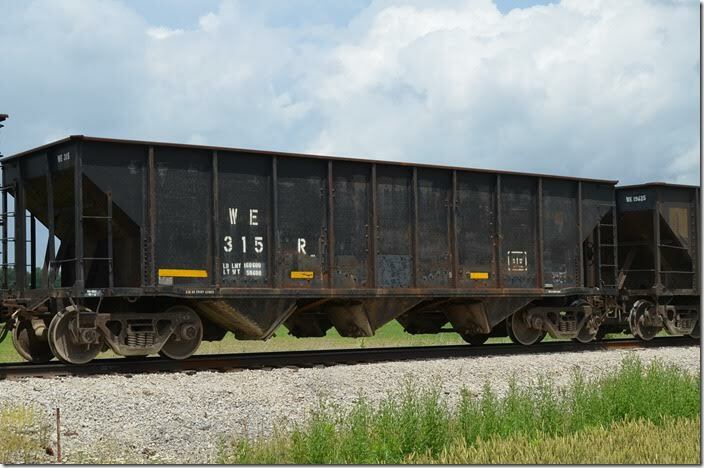 Several hundred similar cars were converted; the 2929-cubic-foot figure for their capacity is unchanged from their days as covered hoppers. CSXT 389738 is ex CSXT 224427 / SBD 224427. Chris. 23. Wheeling & Lake Erie coke hopper 1921 at AK’s Ashland Works. I forgot to ask about the WE 1900 series (1900-1924). 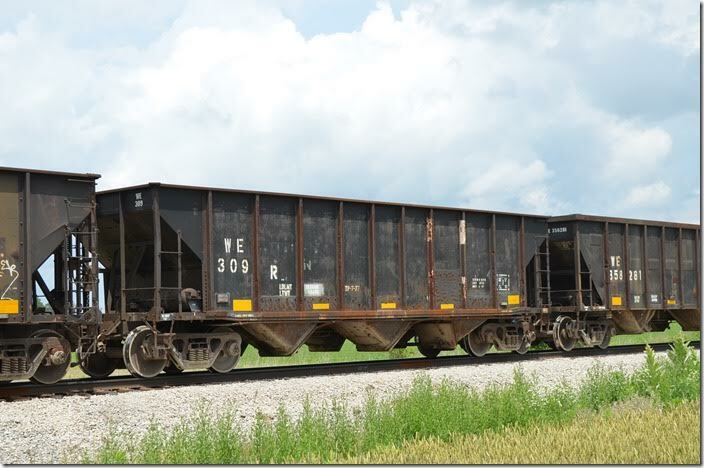 These apparently originated as D&RGW hoppers; more info will be forthcoming. Ashland KY.
WE 1921 is ex WE 19527 / GCCX 19527 / DRGW 19527. Chris. WE 1902 is ex WE 19621 / GCCX 19621 / DRGW 19621. Chris. 25. NS “High Top” was converted from a standard hopper built 07-1978. It now has a volume of 5,465 cubic feet. NS class H63AR. Stored near Marion OH on 06-21-2015. This car is an ex-Con…CR 488445, to be precise. 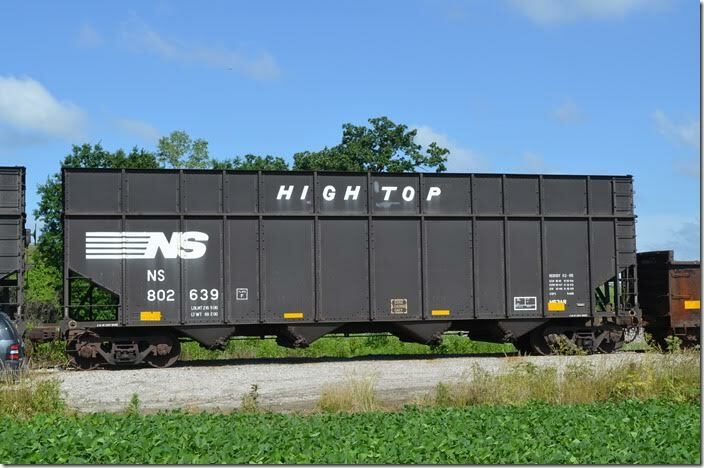 NS hopper 802639 Harvey OH. 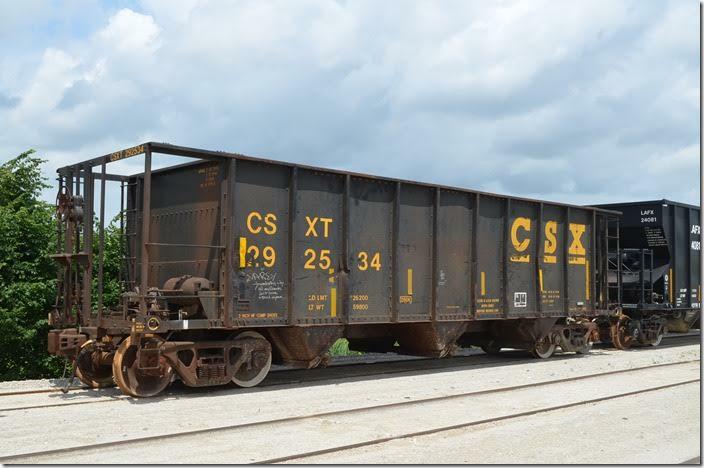 All of these companies like Lafarge, Osborne, Appalachian Railcar, National Salvage, Sultran, Macquairie Rail, Kapstone Charleston Craft, The Andersons, Residco, and Rail Connection have interesting operations and history. Hope this is helpful! One of these days I want to see some of this stuff for myself! Carl. Many, Many Thanks to Eric and Chris for all the helpful historic insight for many of these hoppers.